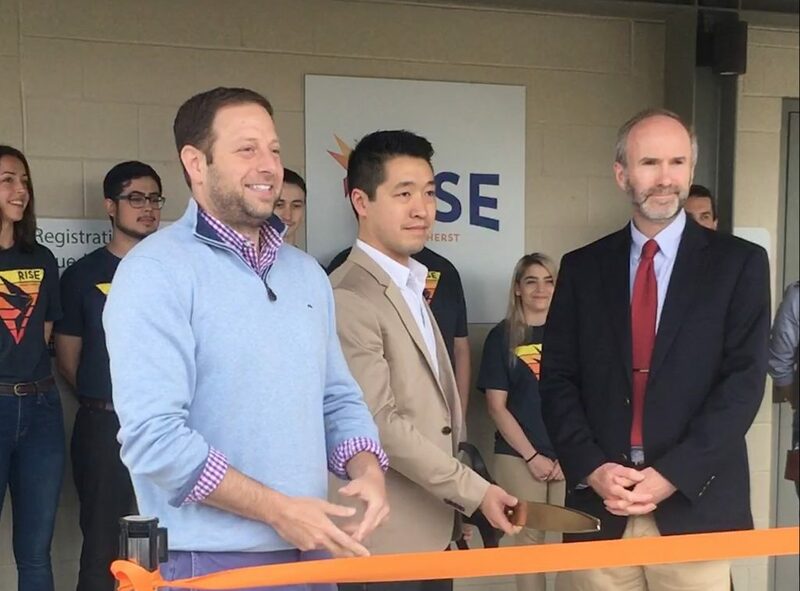 From left, GTI CEO and director Pete Kadens, Massachusetts Market President Matthew Yee, and Amherst Area Chamber of Commerce President Peter Vickery in front of RISE Amherst. Meg Bantle Photo. 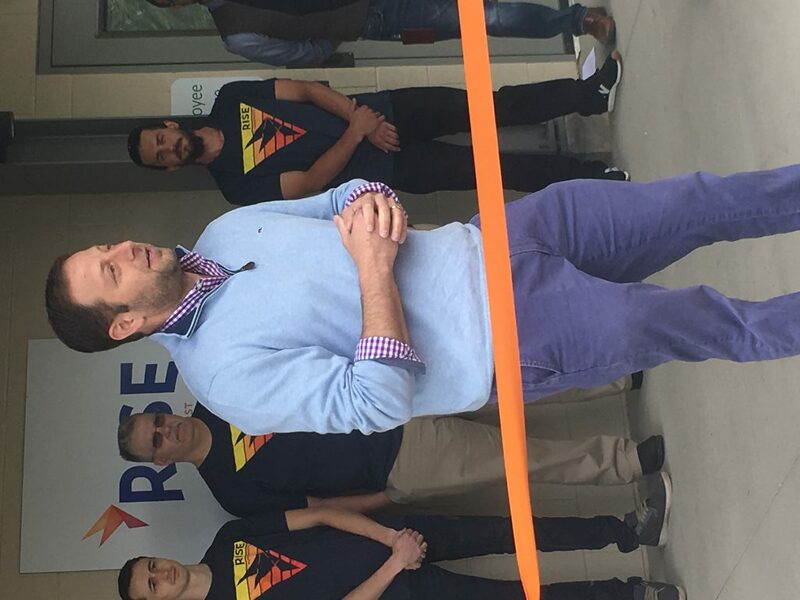 The big scissors were out in Amherst this week as the CEO of the national company Green Thumb Industries (GTI) cut the ribbon in front of the town’s first medical marijuana dispensary, called RISE Amherst. Despite being based in Chicago, Pete Kadens, director and CEO of GTI, said that GTI wants to be a positive contributor to the community by helping to alleviate the opioid crisis by offering an alternative medicine and employing people who have been affected by the war on drugs. 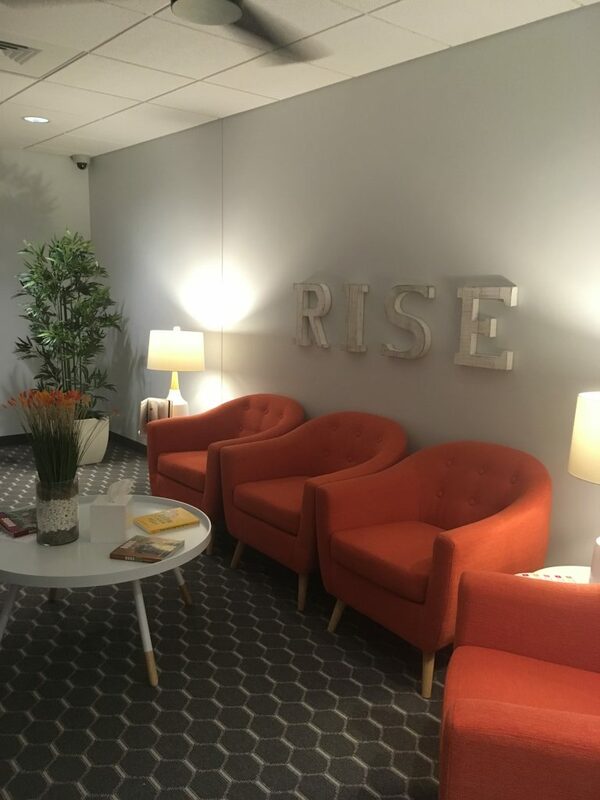 RISE Amherst is GTI’s first dispensary in Massachusetts, though they also operate in Nevada, Illinois, Florida, Pennsylvania, and Maryland. GTI also has a large cultivation facility in Holyoke. As Geoff Kravitz, Amherst’s economic development director, pointed out in an interview, having a medical dispensary in Amherst will make it easier for medical marijuana patients to get the product they need. “It’s something the Amherst voters approved of so it’s something that the town has been considering for a while,” said Kravitz. For many years NETA in Northampton was the only medical dispensary in the area. 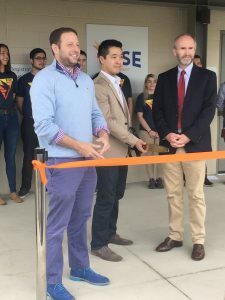 When RISE Amherst opens on May 21, it will be the third medical dispensary open in Hampshire County along with INSA in Easthampton. “We know that without (the town’s) support, things would have been really challenging,” Kadens said. With 45 retail locations in six different states, GTI had enough money to renovate an older building in Amherst for the dispensary and to afford the licensing fees to be a medical marijuana facility. According to Kravitz, it was their experience establishing dispensaries in other states that made GTI appealing to Amherst, despite the fact that they aren’t a local company. GTI and its CEO Kadens are based in Chicago, but Kadens said that they take their commitment to the individual communities where they operate seriously. “We have a pretty robust giving back program,” Kadens said. Inside RISE Amherst, the medical marijuana dispensary owned by GTI. Meg Bantle Photo. The host agreement with Amherst guarantees that 3 percent of gross sales will go towards the town and the company is required to work with police and the community around issues like public safety. GTI also repaired a former auction barn at 169 Meadow St. for use as the dispensary. With no big financial incentive for hosting a medical marijuana dispensary, what are the benefits of being a host community? Kadens pointed out that medical marijuana can be an important alternative to prescription drugs, and they have the opportunity to employ people who’ve been affected by the war on drugs. RISE Amherst will employee 15 to 20 people. In Holyoke, GTI went beyond their required $15,000 community grant requirement. In the fall of 2017, GTI hosted a job fair that attracted hundreds of people. They also hosted another job fair this March where they offered 125 people who have been negatively affected by a criminal record a free session with a lawyer and a free copy of their Criminal Offender Record Information or CORI. Kravitz says that he hopes to use the revenue generated by the new dispensary to fund additional security and traffic needs near the dispensary, but also to support more education opportunities.